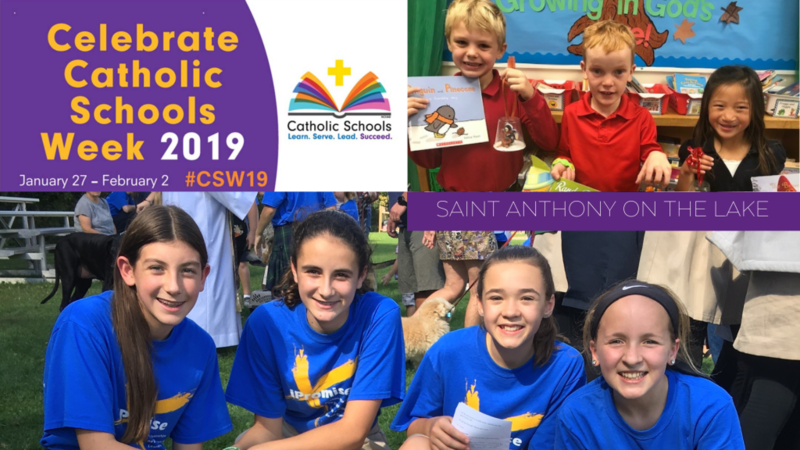 Welcome to Catholic Schools Week 2019! This year, we will incorporate our school theme iPromise into each day's activities! As a service project throughout the week, SAL will be collecting new or gently-used pajamas in all sizes, baby to adult. The pjs will be donated to Joy House. This is a women and children's shelter in downtown Milwaukee. You may send pajamas to school all week! Special thanks to those families speaking at each of the Masses on January 26th and 27th! Below, you will find the dress code of the day! This is always a great week to celebrate who we are as Catholic Schools in a creative, fun (and academic) way! Tickets for this delicious dinner of mostaccioli and meatballs, salad, Italian bread, and home-made desserts are available through any 8th grade student, the school office or HERE. This year, parishioners are also invited to our Open House. We want everyone to see the fabulous ways the new spaces are being used. Appetizers and snacks will be served! Students are asked to wear iPromise mission shirts or Spirit Wear shirts and uniform bottoms to Mass. A service project for everyone's participation will be taking place in St. Anthony Hall. Come and say "hello" to all of our great staff and meet your child's teacher for next school year! Monday will be a spirit wear day.Students may wear jeans or sweats. We will be doing activities with our buddy classes (board games, etc.) and then share a special treat with our buddies. Throughout the week, "Teacher Trivia" will take place with morning announcements. Grades 3K-5th should come dressed like a scientist (or someone in the science field, i.e. doctor, nurse, science teacher). Middle School (Gr 6/7/8) will be attending Mass with Archbishop Listecki at CMH in the morning. Grades 6-8th should wear iPromise mission shirts & uniform bottoms. You may change into your science clothes after Mass. Students will be doing a variety of age-appropriate science activities throughout the day. Dress up on this day. No jeans or sweats please. We will begin our day with 7:45am Mass. Please join us if you are able. The rest of the day will be filled with faith-related activities like a Saints Treasure Hunt and a speaker for all students about vocations. Students may wear their favorite sports/team wear (yes, even Bears and Cubs fans!). These can be professional or high school teams. We will be participating in Olympic activities in the afternoon. Pajama Day! To celebrate all of the pjs that students brought in this week, students may wear pjs. However, these pjs should be clean (NOT the ones worn to bed the night before). All contributed pjs, new or gently-used, will be donated along with a letter to the Joy House. Teacher Trivia will be revealed. Classes will watch a movie in the afternoon.